Decorative louvers offer a different appearance to the appliance, helping it to bring focus in the room. * Please Note: Shown With Painted Black Louvres. *Also Note: This item is a vent free appliance and installation of it may be prohibited in your jurisdiction. Customers are responsible for checking local codes and regulations prior to purchase. 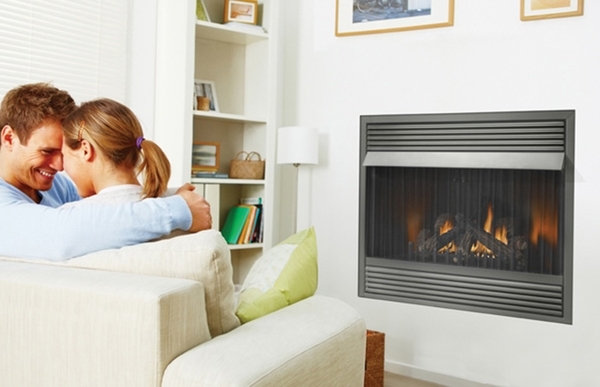 Vent free means that this gas fireplace can be put just about anywhere you want in your home. There is no chimney or ventilation system to worry about. This can be used as an auxiliary heat source. This appliance gives off 30000 BTUs of clean and efficient gas heat. The unit features a limited lifetime warranty. Safety features include a safety shut off and an oxygen depletion sensor. No electricity is required for operation of this fireplace. Can this be used outside? Can it be used completely open without any louvres? What are the dimensions of this Napoleon fireplace unit? This unit measures 42 inches in overall width, 38 1/2 inches in overall height, and 22 inches in overall depth. Are gas logs included with this Napoleon GVF42 vent free gas fireplace? The ceramic gas log assembly is indeed part of the GVF42 and ships at no additional cost. How many square feet will this unit heat? Napoleon states that this unit will produce 30,000 BTU of heat. Based on some rule of thumb, this unit will effectively heat just shy of 800 square feet. This approximation will be affected by the size and shape of the room in which it is installed along with the overall air-tightness of the home. Is it OK to mount a television about ten inches above this fireplace? What blowers do you sell that will work with this fireplace? Because of the vast amount of heat generated by this vent free appliance, I do not recommend installing a television closer than two feet to the opening without either recessing the television to be flush with the wall or using a noncombustible mantel shelf between the unit and the television to divert heat. The two accessory blowers for this model can be seen under the "Accessories" tab on the main item page. Both offer variable speed and thermostat control. Does the unit come with a stainless steel gas flex connector and shut off valve? Per the manufacturer, a flexible steel gas line and shutoff valve are indeed shipped with the appliance. What are the framing dimensions? 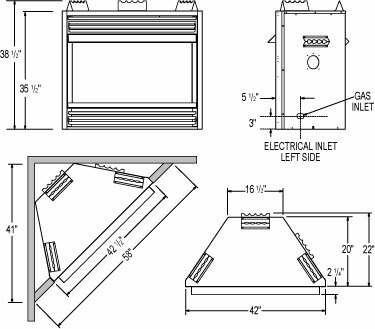 The framing dimensions for this fireplace are as follows: Height - 39 Inches Depth - 22 1/2 Inches Width - 42 1/2 Inches If installed in a corner, the finished wall must be at least 58 inches across for the appliance to fit. If installed on a flat wall, 6 inches of space must be maintained on either side of the fireplace to an adjacent wall. There really is only one thing that I would decide to change if I was going to improve this product, and that would be the addition of an air damper that could be easily and completely closed. Otherwise, I found this heater was very easy to get things warmed up and maintain the heating output. The temperature control is not very precise, but on the flip side, it is easy to light. Additionally, this heater possesses a large surface area and it is also quite easy to clean.